2️⃣ | @1DavionW is now 5-for-6 from the foul line as the Eagles have pulled within three with 5:55 left in the half. Back-to-back triples for the Canes! Timeout Eagles! 2️⃣ | Miami makes back-to-back 3-pointers, which forces an FGCU timeout. 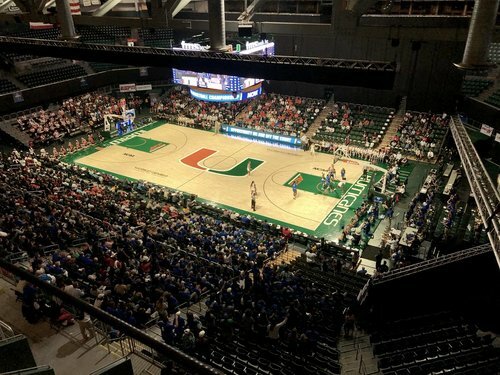 The Hurricanes lead 31-22 with 4:13 left in the half. 2️⃣ | FGCU has attempted 20 3-pointers, making just five. Miami is 11-for-22 from the field and making 4-for-6 from 3-point range. 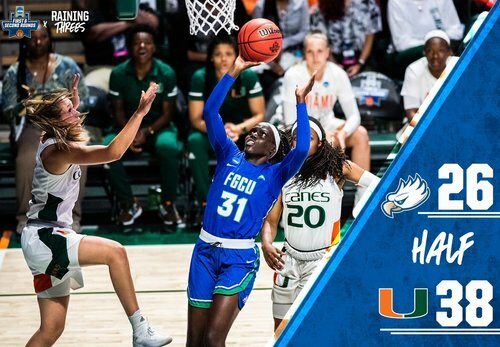 2️⃣ | @SheBe_PhillinIt (6), @1DavionW (5) and @_CallmeKeroee (5) lead FGCU in scoring. First double-digit lead for Miami, as @Beatrice32_ hits a pair from the line. 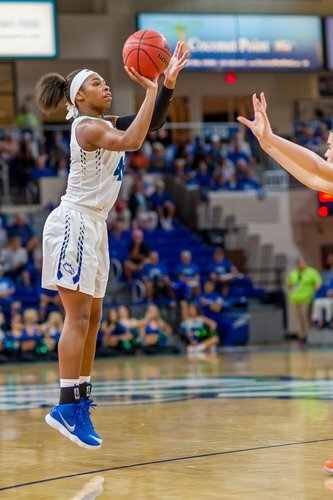 She is now over 200 made free throws as a collegian. Mompremier splits a pair from the stripe, where she is now 4-of-5. Miami is on an 11-2 run and leads by a game-high 12 points. 2️⃣ | At the half, FGCU trails by 12. We make a few more 3-pointers (5-for-23) and we're in this. 20 more minutes to make it happen! 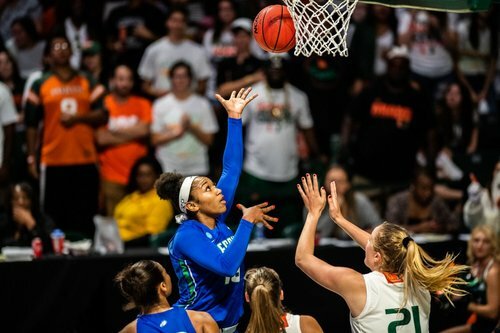 Miami shot 4-of-6 (66.7 percent) from 3-point range in the first half and held FGCU to a 5-of-23 (21.7 percent) clip. Endia Banks has two triples in a game for the fourth time in her career, including second in the past four games. 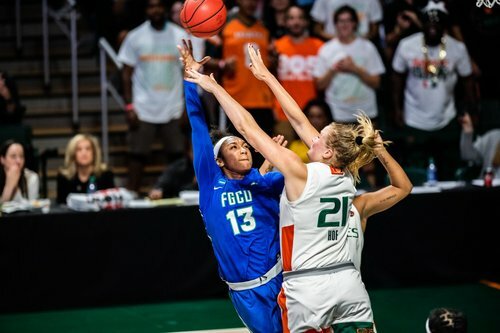 Eagles need to get Destiny Washington involved offensively, only two shots, Nas Ulel 1-for-7 from the field; both have to find some creases against a tough Miami frontline.... easier said than done of course. 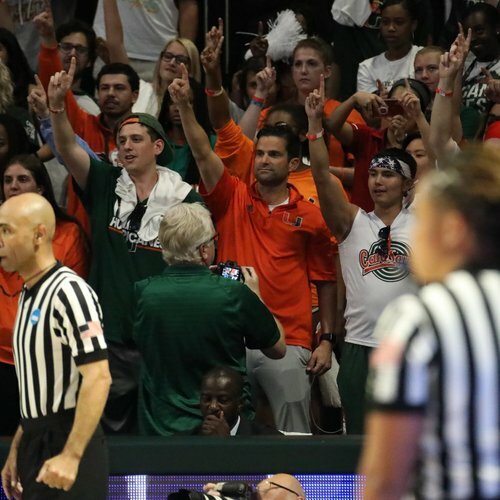 Miami holds a 27-14 edge on the glass through one half of play. Hof (seven) and Mompremier (six) combined for 13 alone. At the half, Kerstie Phills (@SheBe_PhillinIt ) leads the way with eight points off the bench. Her season-high is 13. Bea opens the second-half scoring and gives Miami a game-high 14-point edge. She has 14 points on 5-of-9 shooting. Here's some first-half photos from @tessamort ! Quick 8-1 run by the Eagles cuts the lead to seven, 41-34. 3️⃣ | @tyti_42 buries a much-needed 3-pointer as FGCU is now within seven with 5:52 left in the quarter. 3️⃣ | @_CallmeKeroee is feeling it this half. 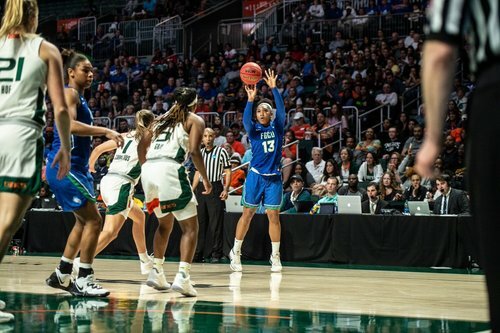 She has eight of her team-high 15 points as FGCU now trails by six with 3:55 left. The Eagles will have the ball after a media break. 3️⃣ | To summarize, FGCU trails 43-37 with 3:55 left in the quarter. The Eagles are 3-for-7 from 3-point range this half and are out-rebounding Miami 6-4. Eagles' run is up to 14-3 and Miami's lead is down to three, 43-40, with 2:30 left in the third. 3️⃣ | @DesWashington_ hits a 3-pointer in transition on a feed from @tyti_42 ! FGCU trails by three, 43-40, with 2:28 left in the quarter.